Smiling is contagious and really the only thing Nurses are okay spreading around. Being happier during your shift usually results in it going by a little faster. I wanted to know how Nurses made their shifts a little more enjoyable. I did some research and here’s what I discovered. Besides the small birthday get togethers in the break room, there are other easy things you can try that can really boost morale. "If it's free, it's for me" my father-in-law always says. I agree, and what makes everyone happy? Free food. How do you get free food at work? One word… potluck. Each person brings in a food dish. When people bring in their old family recipes or their favorite comfort food, you'll end up with a bunch of dishes from different cultures that you've never tried before. Trying new things can be fun! Some hospitals have sign up sheets for sports. Teams could play every sport from volleyball to basketball. We know playing sports inside a hospital is frowned upon. Even though the games are played outside of work, you can always talk some FRIENDLY team rivalry trash talk leading up to the big day. Some other game ideas that aren’t physical are card games and bingo. 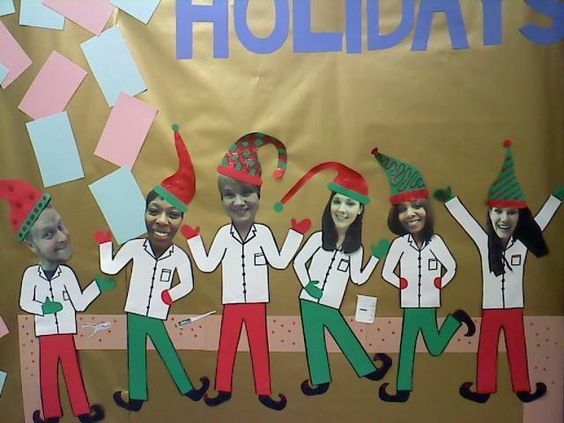 Working holidays gives Nurses a reason to dress up, and if appropriate, act a little goofy around their patients. Nurses have dressed up in everything from elves to clowns. There is a hospital that celebrates “Tutu Tuesdays” where everyone wears a tutu over their scrubs. Guessing games can be very interesting and an easy way to have a little fun. You can bring in pictures from when you were a kid, hang them on the cork board, and guess who's who. Another idea is bringing in pictures of your pets and guess who’s the owner. There is a lab department who hangs employee’s pet pictures in their blood bank area where other departments can see them. They create categories people can vote on. One category was, “Most likely to star in a Steven King movie”. I know when I'm thankful for things, it makes me feel good inside. Hospitals are putting up thank you boards or boards of recognition. One place has cardboard hands that you write on and pin to the board if you want to pat someone on the back for something good or helpful they did. It boosts people's morale and spirits. It also shows they’re all one big team and are there to help each other out. Nursing is not all fun and games. There are those hard shifts, the sad moments, and trying times. Try to stay positive and lean on each other to get through those times. Cherish the good times and celebrations!